Iger’s compensation package last year included $2.5 million in salary and the rest in various stock and other awards and bonuses. 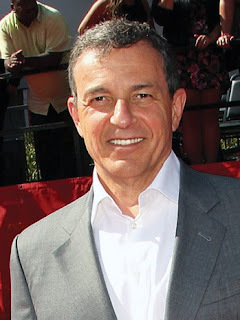 The company also shelled out $574,331 for Iger's security and $190,439 for his personal air travel. The executive's raise in compensation amounted to 20 percent in fiscal 2012, which ran Oct. 2, 2011, to Sep. 29, 2012. During that time, Disney stock rose 76 percent. In calendar 2012, the stock was up 35 percent, and it closed Friday fractionally lower at $52.34. James Rasulo, Disney’s CFO, saw his compensation rise to $12.2 million last year. It was $11.07 million the year prior. Alan Braverman, general counsel and senior executive vp, earned $8.3 million, up from $7.8 million. Executive vp Kevin Mayer was paid $4.2 million, up from $3.9 million, and chief human resources officer Jayne Parker was paid $4 million, up from $3.6 million a year earlier.